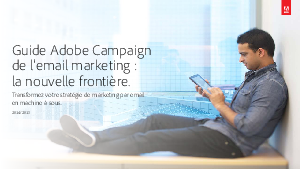 > Adobe > Guide Adobe Campaign de l’Email Marketing : la Nouvelle Frontière. Today’s consumers respond differently to email. They prefer to first read them on their smartphones and then perform follow-up activities, like purchases, on their tablet or laptop. And they expect emails to be visually attractive and easy to read on each device. Consumers also give their time and attention selectively. Spray-and-pray emails are out; personalized and relevant emails are in. You must know your customers to determine which content and offers resonate. And you must deftly deliver those experiences while taking into account the customer’s location, device, on-site behavior, and relationship with your brand. This guide explains innovative email marketing tactics and offers practical advice on using them. It addresses following the customer through the customer lifecycle and serving tailored content within the context of location and device. The guide provides proof that these approaches work by looking at ROI and other success measures. Download this guide now to find out more.